Today I’m joining the Friday Mashup Bloghop celebration of their 200th challenge – and I’m adding it to my Watercolor Flowers series! They asked for a mashup…and when I mash a lot of things together, I try hard to aim for Clean-and-Simple too; mostly because it’s too easy to overdo a multi-challenge card. If you’ve been following along, you’ve seen a few of my videos in the series (HERE) – and this one isn’t quite in the same vein as the others, but it’s still watercolor. 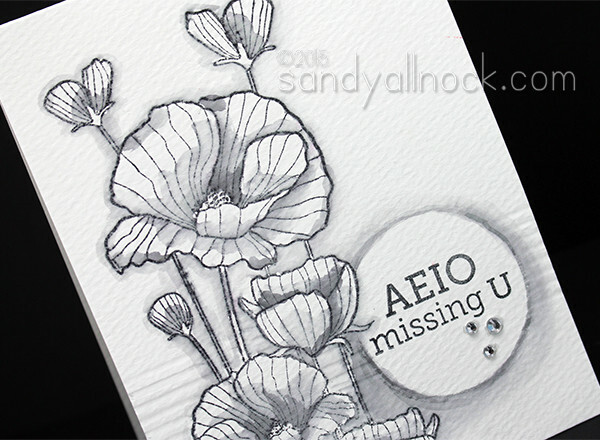 Today’s card is both CAS and one-layer…mashing #21 (Sketch + Dry Embossing) with #71 (Black & White + Bling). I got the idea when I had accidentally stamped this stamp in the wrong ink…and decided I’d try doing that deliberately this time. Enjoy the video below, or click HERE to watch it in HD on YouTube! It was quite the unique challenge to do watercolor flowers in black-and-white only….and I also wanted to mention you might get a similar look to this with distress inks BUT – the Memento will hold up better and keep some of its solid lines. As soon as you hit the distress inks with water it’ll start to break down pretty madly. Fair warning. I’ll be sharing some other colored stamps of this particular image on Instagram today – my plan is to try coloring this in a few ways this morning as part of the #thedailymarker30day challenge! Note and question for subscribers!! This is the first week with the new email delivery system, and I’m thinking about something…yesterday’s bloghop post went up later than the 5am time I’ve picked for my blog posts to get emailed out. So this morning, you probably got yesterday’s AND today’s, all in one. At least I’m hoping that’s what happened? I may adjust the time that my posts get emailed out – make it at noon or something, so morning bloghops get emailed out that day. My question for subbies: What time of day and time zone do you visit blogs? The rest of the challenge blogs are HERE – go see what everyone else is creating! More in the watercolor flowers series is to come, of course, so be sure you’re subscribed (in the sidebar on the blog, or at the bottom of the page if you’re looking on a mobile device)! Sandy, I wanted to drop a quick thank you to you…I tried this technique a couple of nights ago and love the results. I’ll need to practice a bit and experiment with my variety of black dye ink pads, but I’m thrilled with my first attempt and have used it for a card, YAY! Sandy, I’m so thankful to Altenew and a blog hop a few months ago as they’ve introduced me to your talents. I don’t comment much even though I’m thrilled with your content but as you have a wonderful talent (and sense of humor), the projects that are extraordinary (to me), I must give credit where credit is due…. I LOVE LOVE LOVE THIS black and white mash up! Great tips too, thank you!! !